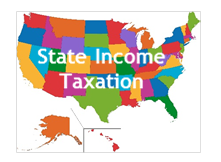 As I noted in a prior article, states are all over the board on their income taxation. An individual in a state with a high state tax rate could use a nongrantor trust to hold some of their income-producing assets and thereby avoid state income taxation on the income from those assets. Briefly, trusts may be taxed as grantor trusts or nongrantor trusts. A grantor trust is taxed directly to the grantor, so this type of trust doesn’t help if you’re trying to avoid your state of residence’s income tax. However, a nongrantor trust is a separate taxpayer. As such, a nongrantor trust could be a resident of a different state than its grantor. Let’s look at a quick example: Mary sets up an irrevocable nongrantor trust in Nevada, a state without any state income tax. She avoids any triggers for the trust being a resident in any other state. The trust has no income that would be deemed sourced from another state. Thus, the income of the trust would face no state income taxation. However, states have complicated rules on when they will try to tax a nongrantor trust as a resident. States tax based on where the trust is administered / trustee is resident, where the beneficiary is resident, where the grantor was resident when the trust became irrevocable, etc. Each state has a different set of rules. Here’s a link to a helpful chart of those rules for nongrantor trusts. Just because a trust is administered in a state without an income tax does not mean that other states might not try to claim the trust as a resident of their states. Let’s look again at the example of Mary’s trust set up in Nevada. If Mary were a resident of Maine when she set up the trust, Maine would consider the trust a resident of Maine. If the beneficiaries of the trust were residents of California, California would consider the trust a resident of California. When a state considers a nongrantor trust to be a resident, it will tax it on all its income, not just the income derived from sources within that state. Kaestner v. North Carolina examines the constitutionality of a state taxing a trust as a resident when the trust is not administered in the state and the trustee doesn’t live in the state. The North Carolina Supreme Court held it was unconstitutional for the state to tax the trust under those circumstances because there weren’t sufficient contacts with the state. Here’s a link to that case. The U.S. Supreme Court decided to hear the appeal in the case, so we could see new developments in this area before too long. If you set up an irrevocable nongrantor trust in a state without a state income tax and you scrupulously avoid triggers which would consider the trust to be a resident of any other state, you can avoid state income taxation on the assets you put in the trust. Kaestner could simplify this process.